Standardized and validated self-administered outcome-instruments are broadly used in spinal surgery. Despite a plethora of articles on outcome research, no systematic evaluation is available on what actually comprises a good outcome in spinal surgery from the patients’ and surgeons’ perspective, respectively. However, this is a prerequisite for improving outcome instruments. 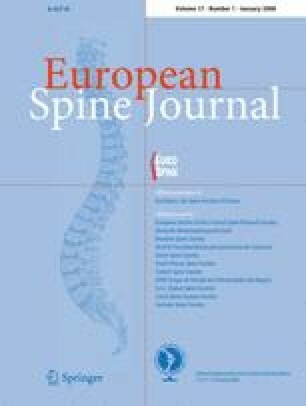 In performing a cross-sectional survey among spine patients from different European regions and spine surgeons of the SSE, the study attempted (1) to identify the most important domains determining a good outcome from a patients’ as well as a surgeon’s perspective, and (2) to explore regional differences in the identified domains. For this purpose, a structured interview was performed among 30 spine surgeons of the SSE and 353 spine surgery patients (representing Northern, Central and Southern Europe) to investigate their criteria for a good outcome. A qualitative and descriptive approach was used to evaluate the data. Results revealed a high agreement on what comprises a good outcome among surgeons and patients, respectively. The main parameters determining good outcome were achieving the patients’ expectations/satisfaction, pain relief, improvement of disability and social reintegration. Younger patients more often expected a complete pain relief, an improved work capacity, and better social life participation. Patients in southern Europe more often wanted to improve work capacity compared to those from central and northern European countries. No substantial differences were found when patients’ and surgeons’ perspective were compared. However, age and differences in national social security and health care system (“black flags”) have an impact on what is considered a good outcome in spinal surgery. No benefits in any form have been or will be received from a commercial party. Study funded by a grant from the AOSpine, Grant number E-ORD 04/104.